One Size Does Not Fit All: We have dog beds and pet beds from XS-XXL. 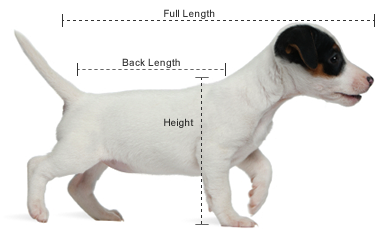 Here are some tips to find out what size your dog is. Please use our easy Size Guide to measure your pup and find the right bed or crate. Be aware, these are approximations. If you have questions, we can help by phone or email. We have over 30 years of dog experience to guide you! For Beds: Measure your dog in in his sleeping position; from nose to the base of the tail. Check the width your dog also. Add a minimum of 5 inches to determine the needed length and width of the bed. Depending on the breed you may need a bit more than that This ensures that your dog doesn't feel as if he's falling off the bed. For Crates: The two most important dog crate dimensions are the height (H) and length (L). Find out how tall they are from their feet to the top of their shoulders, and how long from nose to tail. If your dog has a long tail, include some extra lenght for comfort. Once you have your dog’s height and length, add 2-4 inches to the height and the same to the length. These should be the minimum height and length measurements for the crate. For a trained dog give them plenty of comfort space, they need to be able to stand, turn around and get comfy. Puppies are a different subject. Sleeping Style:. Does your dog stretch out or curl up when they sleep? Younger dogs tend to curl up more when they sleep because their bodies and spine are more flexible. Older dogs tend to stretch out. If your dog curls up most of the time, make sure you get a bed big enough for her to stretch out if she wants to. Finally: Observe your dog’s sleeping habits before you choose your dog’s bed. Do they like to curl up in a ball or sprawl out? Do they always tuck themselves in a corner, or do they lay down in the middle of the room? Do they look for the most comfortable cushion they can find, or does your dog flop down anywhere, including the hardwood floor? If your dog likes to stretch out, you may want to consider buying one size larger bed than what is suggested in the "size guide". When in Doubt: Always get the larger size. A bit bigger won't hurt as long as it will fit in your room. Be aware that different manufacturers have different sizing criteria are not the same provided. Look at the dimensions (not the size) listed to double check that you are picking the right size. Again it is better to buy too big than too small. Returns are time-consuming and costly.